Handy for simple family sites, but doesn't have the power for anything more. DreamHost Website Builder, Remixer, is an interesting service which aims to make it easier to build your own websites. Remixer doesn't have the hidden catches you'll often see elsewhere. You're not forced to use someone else's subdomain, for instance - DreamHost gives you a free domain for a year. There are no limits on the maximum number of pages you can have, your web space or bandwidth. Surprisingly, you can use the service to create and manage an unlimited number of websites. That's an unusual extra which you don't often get with even some high-end hosting packages that feature in our best website builder countdown. DreamHost's Standard plan has one significant restriction in that it doesn't support email accounts (you can't host yourdomain.com and set up your.name@yourdomain.com email addresses.) But that won't matter to everyone, and the price is very reasonable at just $4.95 (£3.54) a month. The similar Wix Combo plan limits you to 2GB bandwidth, 3GB storage and a single domain, and is significantly more expensive at £5.16 ($7.22). If email is critical, the DreamHost All Access plan gives you unlimited email accounts and mail forwarding support for a still reasonable $7.95 (£5.68) a month. Most website builder services spend a great deal of time boasting about their abilities, but very few allow you to get a feel for them before you sign up, even at the most basic level of displaying their templates. DreamHost is refreshingly different. Point your browser at Remixer's site and you're not only able to look at its small selection of templates (nice designs, but only twelve in total), but you can also preview them at active websites to see how they work. If you need to know more, that's fine - DreamHost allows you to sign up and trial the service for free, no credit card details required. We gave this a try, and it couldn't have been much easier. Hand over your email, choose a password, and you're instantly logged in to DreamHost's account management console. The console was just as straightforward. The body of the page had a thumbnail of the template we'd just selected. A Settings box enabled assigning an existing domain to this website, integrating Google Analytics and (once you've upgraded) adding email accounts. And clicking Edit opened our template in DreamHost's editor, just as we expected. Alternatively, a separate Create wizard enables customizing the template with your choice of layout, images, colors and fonts. It's all very well presented and you can work your way through all the necessary steps in a very few clicks. The end result is even total web design newbies can be logged into and browsing DreamHost's features in probably less than a minute. That works for us, but it's not just about beginners: if you're interested in website builders in general, or perhaps you've already signed up with someone else, DreamHost makes it exceptionally easy to compare their service with your current product. Remixer templates are single-page sites based around simple content sections (text blocks, images, maps, videos.) You can navigate these sections from the left-hand sidebar, or just scroll up and down in the editor to find whatever content you need. Unlike most website builders, you can't add new content by dragging and dropping objects onto the page. Instead, you must tap a New icon to add content above or below existing sections, greatly restricting your layout options. You're only able to add a small set of pre-designed content blocks, such as headers, footers, maps, images and image grids, videos and forms. There's no way to add a single element to a section, such as a button to perform a particular task, and there's no 'Embed HTML' or similar option to enable adding custom services to the site. Remixer also doesn't have a library of third-party extensions, unlike top competitors such as Wix and Weebly. Even Remixer's limited controls don't always work as you expect. Rather than have a general table control where you can directly set the number of rows and columns you need, Remixer has a table for text content and a grid for (mostly) images. There's no obvious 'Rows, Columns' setup, and instead you must add cells individually, which didn't make a lot of sense to us. Remixer's content blocks can be customized in much the same way as other website builders, though with few options and settings. Click a text block, for instance, and you can edit the contents as required and change font, style, alignment and colors. But there are no fancy extras like shadows, background images or animations, and you can't resize the text block or drag and drop it to a new position in the content block. There's one major annoyance in the lack of a Preview button, which would normally allow you to check out any changes to your site before you published them. There is a workaround - go to My Sites, click Settings, find the URL in the Preview box and paste it into a browser tab - and you could simplify the process by bookmarking that address, but you shouldn't have to do that much work to carry out such a basic function. None of this will matter very much if you're making very simple changes to a basic website, maybe editing some text or replacing an image. But if you're planning anything more ambitious, the lack of power and control of the site could quickly become a problem. Remixer provides simple content sections to handle single and multiple image, as well as videos and SoundCloud audio. There's little low-level control over the layout of these sections. Add a photo, for instance, and you'll get an image aligned to the left, with a text heading to the right and a text paragraph underneath. You can delete the heading, the text or both, but you can't reposition these elements or resize the text boxes. Clicking an image displays a left-hand dialog box with a few useful options. You're able to rotate your picture, flip it horizontally, change its opacity or scale and reposition the image in the frame. There's better news with Remixer's free stock images. The interface is clumsy - you can't directly search from the Stock Images tab, for instance - but it only takes a moment to figure out how it works, and the images are sourced from the excellent Pixabay library. We tried out Remixer's photo grid and video controls and found they had very similar issues. Formatting options are extremely limited, so for example you can't even resize a video frame, and the controls you get aren't nearly as straightforward as they should be. Remixer does score one major media handling hit with its Content Manager, a very comprehensive tool for importing and managing content for reuse across your websites. If you've used other website builders you'll know they generally have something similar, perhaps the ability to store commonly-used images in the cloud, but Remixer goes much, much further. The Content Manager doesn't just support images, for instance. You can use it to store audio and video files in the cloud, too. You're not restricted to uploading content from your own computer. Remixer can also import images from Facebook, Flickr, Instagram and Twitter, as well as custom URLs. Import a lot of content and this could make for a cluttered display, but a simple tag-based system enables organizing them in custom content groups. These functions don't always work quite as we expected - trying an import of TechRadar returned just four thumbnails, for instance - but overall the Content Manager delivers far more than you'll get anywhere else, and we have to applaud DreamHost's ambition. Most website builders have some level of blogging and e-commerce functionality, sometimes even with very basic plans - Wix allows selling up to ten products for £5 ($7) a month. Remixer doesn't bother with any of that, unfortunately. There's no native blog or e-commerce platform, and with no third-party controls or an Embed HTML option, you can't even add as much as a PayPal button. If your website is misbehaving and you can't find the problem, it's important that your website builder has a support team ready to help. DreamHost provides a basic set of Remixer articles on its support site, but they're mostly simple 'how to' guides and tutorials. They're not going to help you with troubleshooting or anything else more advanced. Remixer has its own support team, but the FAQ says this is strictly limited: no telephone number, no live chat, and although you can raise tickets or send emails, you'll only get responses 'during regular staffing hours, 10AM to 6PM Pacific Time, Monday through Friday.' 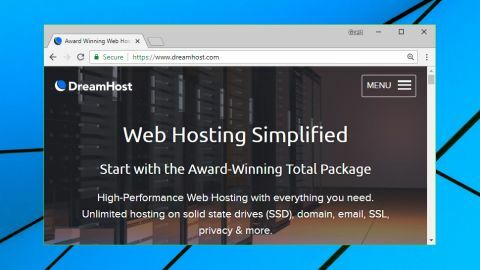 DreamHost says its general hosting support is available 24/7, though, so you should at least be able to get help with major server or network issues. Remixer might work as a basic editor for simple personal sites, maybe one each for everyone in the family, but it's too underpowered for serious professional projects.